When Motorola CEO Dennis Woodside sat on stage at D11 a few weeks back, he confirmed that his company would “broadly” distribute their next wave of smartphones. 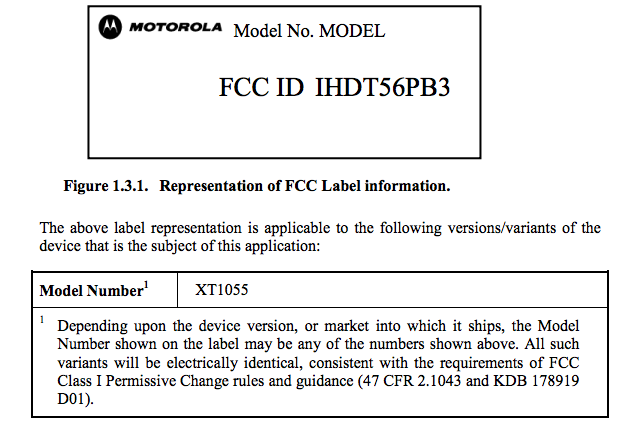 With today’s FCC filing of the Motorola XT1055 headed to U.S. Cellular (LTE band 12), an XFON variant, we now have at least four variants of this phone confirmed for U.S. carriers. The listing helps us add another model number to an ongoing list that represents the XFON, which could very well be a part of the new Moto X line of phones. We know that the XT1060 is Verizon’s variant, XT1056 is headed to Sprint, and the XT1058 is on its way to AT&T. The only major U.S. carrier we have yet to see a filing for is T-Mobile. As for specs, the device is expected to run on a Snapdragon S4 Pro dual-core processor clocked at 1.7GHz, carry 2GB RAM, 16GB of storage, 10MP rear camera, 2MP front camera, 720p display, and run Android 4.2.2. Since that sounds mid-range, we are expecting Motorola to introduce new sensors or software that can predict your every desire as it happens. Well, it’ll at least do things like turn your camera on when you pull your phone out of a pocket, but only at the precise moment you need it to happen. We have no confirmation on a release or price, though we are expecting it to happen soon.